← Sunshine Soba Noodle Stir Fry and Contest! Lately I have been obsessed with avocados. Perhaps I am homesick for California, or maybe I just love their creamy taste, but we have been going through almost 5 avocados a week. This week, I created an awesome creamy sauce from these lovely fruits and paired it with spaghetti squash, Sunshine Burger, ripe tomatoes, and cilantro. The results were an amazingly filling, nutrient packed dinner that is a hit with vegans and non-vegans alike! Preheat the oven to 425 degrees F. Slice spaghetti squash(s) in half, remove and discard seeds. Put 1 cup of water in a rimmed baking dish. If you are using 2 squashes, you may have to use 2 pans (and therefore 1 cup of water in each pan). Place the spaghetti squash face down in the pan and bake until a fork slides easily through the top of the squash (approximately 30-45 mins). Remove from the oven and let cool until easy to handle. When cool, scrape the spaghetti squash “noodles” from the squash with a fork into a large bowl. When the squash is cooking, prep the creamy avocado sauce by pureeing ripe avocados in a blender, or with an immersion blender. Once the avocado reaches a smooth consistency, transfer into a medium sized mixing bowl. Add in the almond milk, one tablespoon at a time, and stir until completely combined. Add all seasoning and stir again, until well combined. Pour the avocado sauce on top of the spaghetti squash. 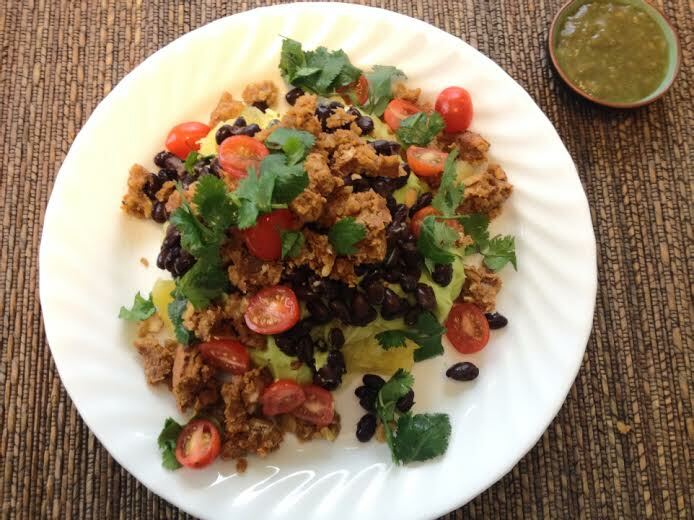 Top with black beans, Sunshine Burger crumbles, tomato, cilantro, and serve. If you would like an extra spicy kick, top each serving with your favorite spicy salsa. This entry was posted in Dinner Recipes, Gluten-free Recipes, Vegan Recipes and tagged Avocados, Barbecue Sunshine Burger, black beans, California, cilantro, easy vegan dinners, Loco Chipotle Sunshine Burger, Spaghetti squash, spicy salsa, Sunshine Burger, tomatoes. Bookmark the permalink.